So writes Laqueur (Center for Strategic and International Studies; The New Terrorism, 1999, etc. ), a longtime, and prescient, student of terrorist movements through history. In this survey, he ranges over some of those movements—the IRA and the Irgun against the British, Algerian independence fighters against French pieds-noirs, anarchists against capitalists—to discern the patterns of organization and action that define what strategists term the “asymmetric warfare” of terrorism. 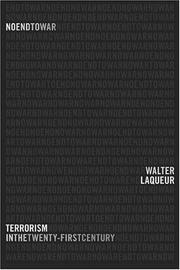 Real wars, writes Laqueur, are expensive, but terrorism is relatively cheap and open to all comers, which means that terrorism as we now know it “will be with us for as long as anyone can envision, even if not always at the same frequency and intensity” as it raged in September 2001. That month brought to America a horrendous fact that much of the rest of the world has known for a long time: citing the Indian subcontinent as a likely flashpoint for terrorist movements in the coming years, Laqueur observes that the number of victims of terrorism in the single Indian state of Tripura “was larger in the 1990s than that in the Israeli-Palestinian conflict,” a fact that few world media or governmental figures have bothered to explore. Laqueur explores this imbalance while calmly insisting that terrorism is an ineradicable fact of modern life—and calmly reassuring American readers than there is no good evidence to suggest that we’re any more hated than any other imperial power of the past or present. Even so, that will come as small comfort to those who envision happier times ahead, for, Laqueur argues, “there is a huge reservoir of aggression” out there, thanks to which “the combination of paranoia, fanaticism, and extremist political (or religious) doctrine” on which terrorism feeds will only blossom in the years to come. A sobering analysis of geopolitics and current events.